Hi all! I bet you have seen these tiny walnut shells filled with love and detail and teddy bears and such? 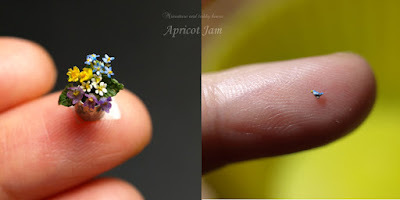 По-русски интервью с мастерицей Apricot Jam можно прочитать в моих блогах Little fun и Ярмарка Мастеров. My name is Momo Izumi. I live in a place called Hokkaido in the Northern part of Japan. My family is my husband and two very cute two cockatiels. I am a nature lover. My nickname is Anzubear. What is your profession? Where have you studied and what do you do for Living? 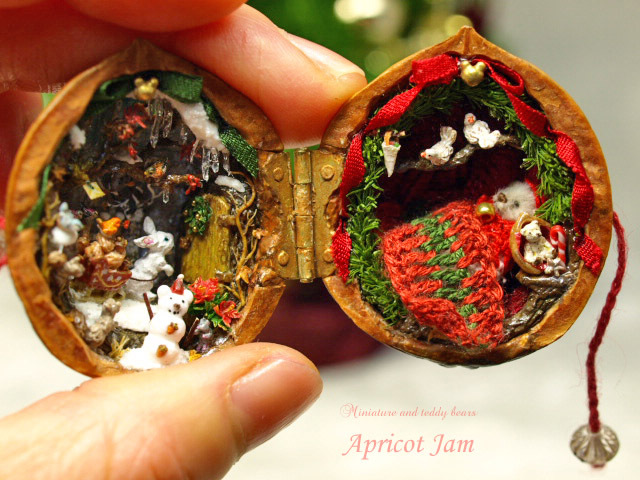 "Apricot Jam" is a brand name of my work. There is no deep meaning. 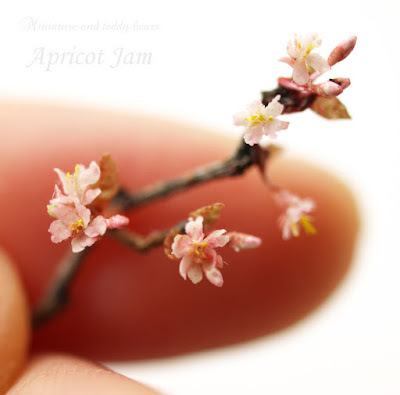 When I was a child, "Apricot jam" was tasty and I liked it a lot. "Apricot" in Japanese is translated as 杏 and pronounsed as "Anzu", I can't take a hieroglyph into my nick, so on the internet it turned into transciption "Anzu". So Apricot and Anzu are just the same. How did you handmade /craft story begin? Fourteen years ago, due to my illness, I could not continue working at the animal hospital. 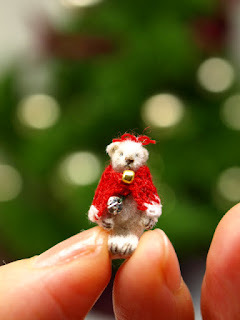 So, in my house, I made small accessories from clay, sewed miniature bears, and then I started selling them. 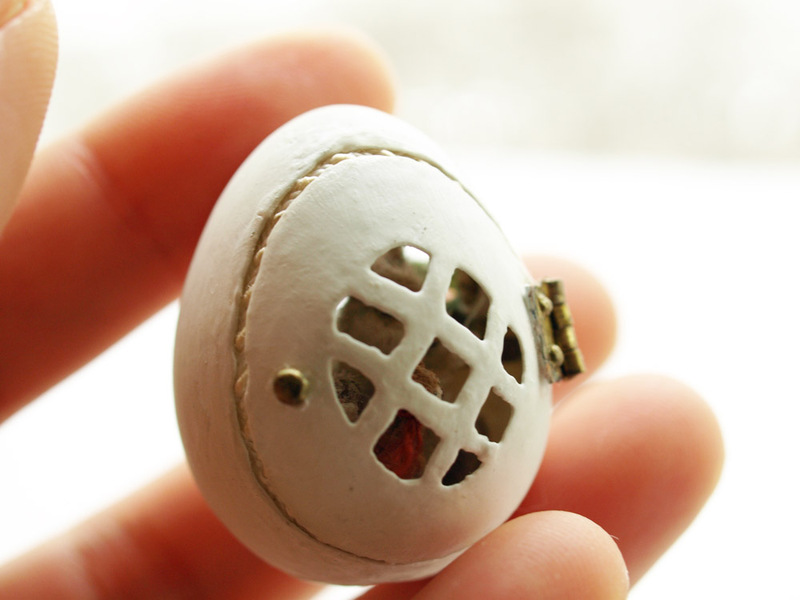 Often love to handcrafts and to miniatures begins in childhood - tell a little about your young years. When I was a child, I lived in the city and I longed for a countryside with lots of nature. 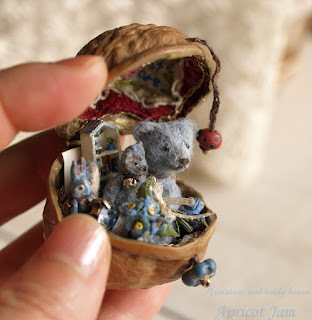 When I went to play in the country, I gathered beans, leaves, petals, then I was making dolls, playing with them and their walnut beds. (Like Thumbelina...) From that time I have ant unchanging feeling: "I like small things" and "I like nature". I think that my current work reflects it well. 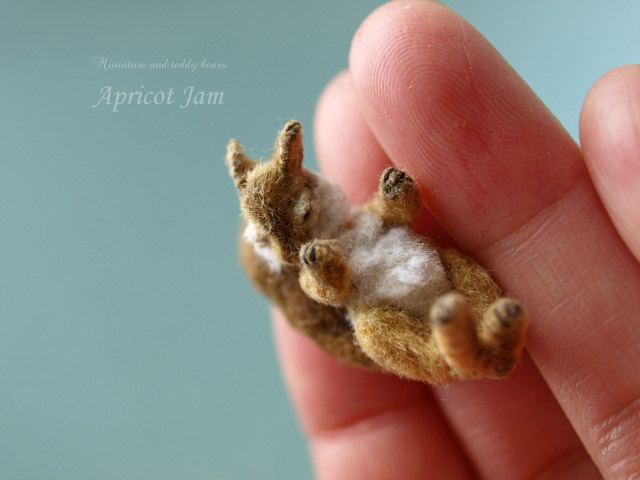 What was your first handmade creation? I wonder what was it? The hippopotamus made of peanut shells, which I made at the kindergarten, then I decorated it at my father's workplace. I was young, so I do not remember when I made it. My father is a doctor, not an artist, but I think he is good with his hands. My mother is a housewife, not an artist either. My parents house is about one hour from my house by car, I called them and asked about peanut shell hippopotamus. They said "It is a pity that your hippopotamus is missing." Probably, I last saw my hippo when I was around 22 years old. These days, my parents are very into their grandchildren. How did this idea of ​​making a scene in a nutshell / shell / egg appear? I loved "a state where something small is inside a small container" since childhood! 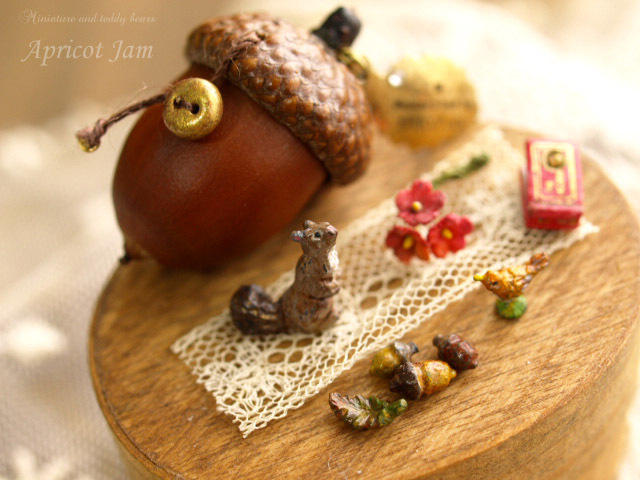 What was the first room for the miniature - nut, egg, acorn? 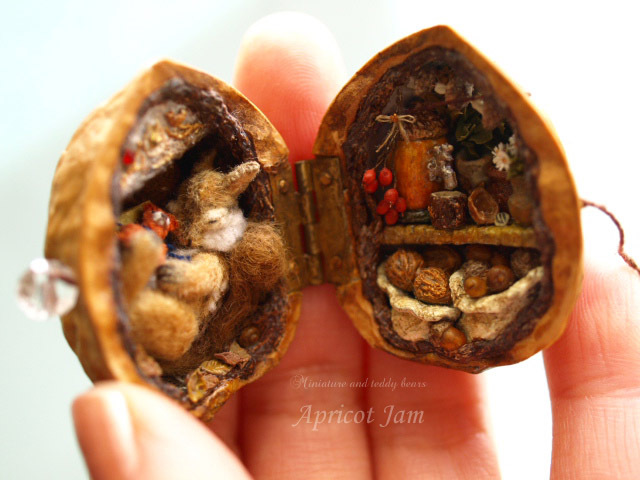 A walnut. 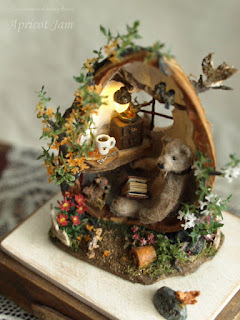 For the first time about 14 years ago I made a room for a bear in the walnut that I got in my grandfather's garden. 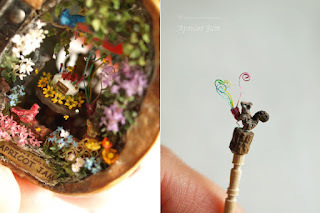 Do you create miniatures for yourself or for sale too? I make miniatures to sell. 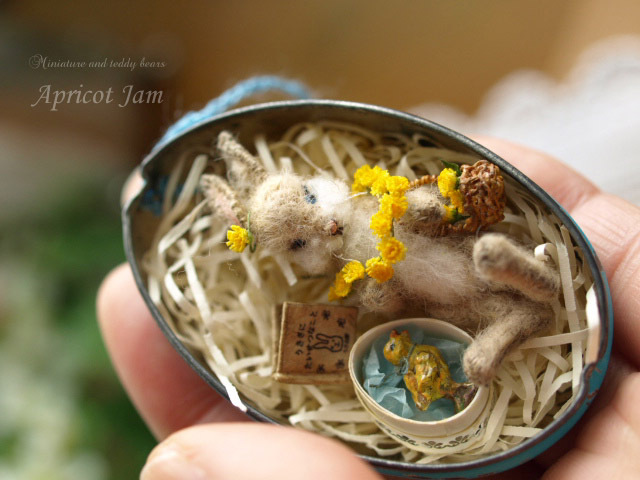 All the miniatures produced are sold. My miniatures are sold several times a year, on the site of yahoo auction in Japan. Oh, sorry ... there are not faithful records and my memories are so vague. 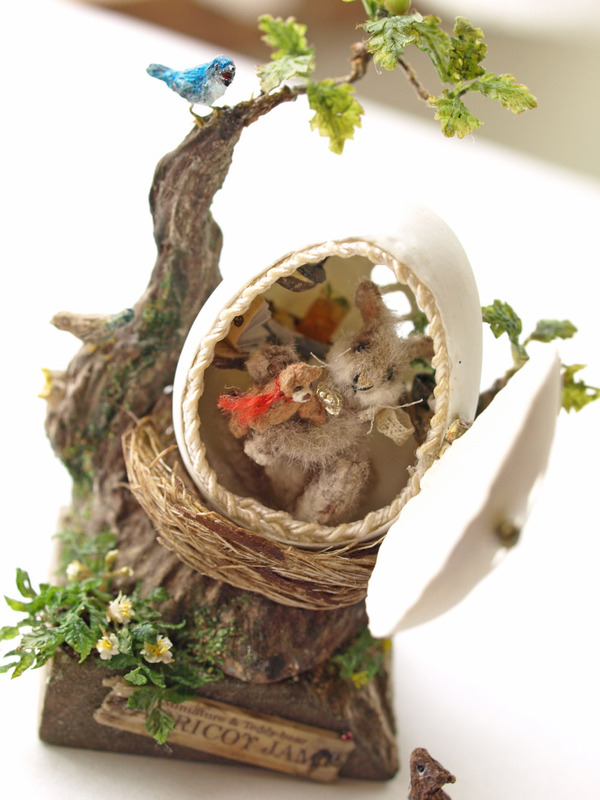 I'm using an auction-system to sell my creation, the winning bid range of those is wide. My latest creation "Forget-me-not bear" was sold for 220000 Japanese yen. The price is always very unpredictable. It was about 50000-250000 yen (these 10 years) for one piece, I guess. In 2002-2004 it was about 3000-40000 yen, I believe. I don't have available items now at the auction, but I'm going to sell a Christmas walnut (terribly behind schedule!!!) in this month. Why don't you keep a nut or two for yourself? I wish I could but I can't... :'-( I need to sell my creation to earn a living, and I get bored soon when I make a same creation. What tools do you use? Any unusual or favorite tool you can spot? I am not using that special one. I am using something normally sold in Japan. An inexpensive wooden toothpick is useful. I sharply scrape metal spatula for clay with a file to make small workmanship. Do you use any optical devices for your work - magnifying glass, microscope etc? I use the Stand Magnifier from time to time. Have you ever thought of becoming a jeweler? (Usually people say "Wow! That's a jewelry work!" 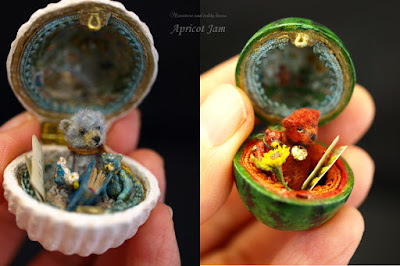 - when they see something so tiny and so detailed) Or maybe you are the one? Actually I have been studying the engraver craft for about three years, I come to the classroom several times a month. What part of the process do you like most of all? 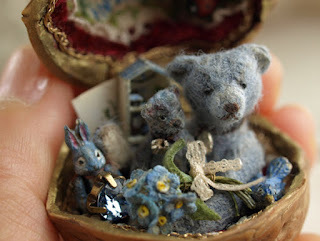 I especially like sewing the face of a teddy bear and making small animals from clay. Have you ever made teddy bears in full size, I mean like they are are 30 cm or such? I've only made miniature teddy bears. 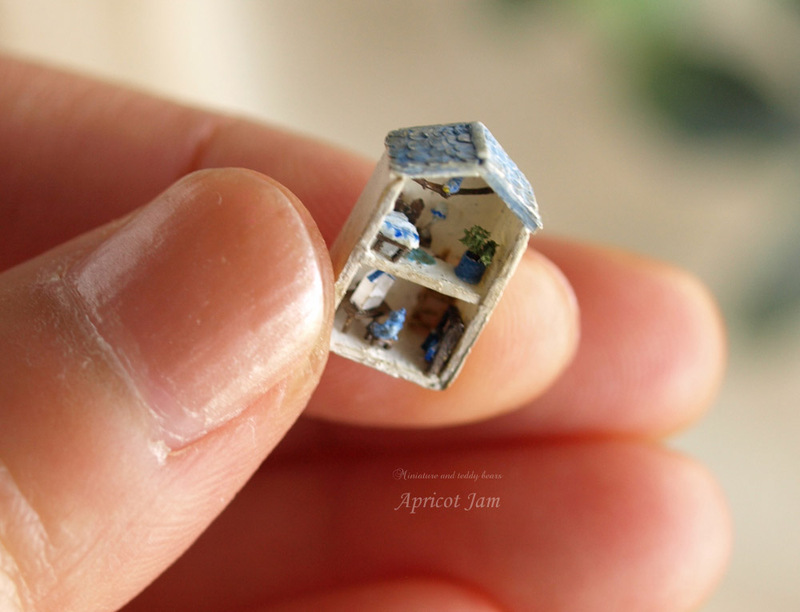 Because I love small things! 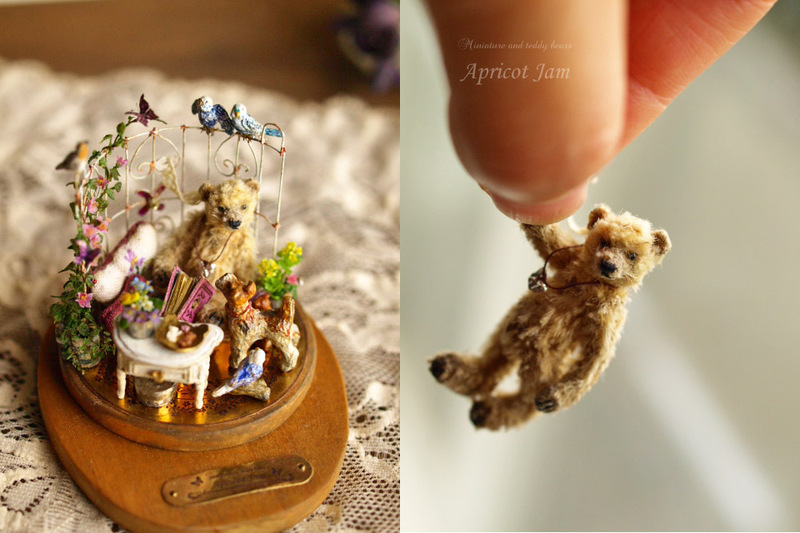 The largest original teddy bear that I ever made is about 6 cm tall. What is your favorite project from all you've made? I wonder which is the my favorite work?.. That's a difficult question! I put my whole heart into making those. Uh...therefore, I love all of them, I'm proud of all my creations. How long does it take you to complete one project? It takes me more than a month to finish one project. It may take more than half of a year sometimes. What are your plans for the future? Any resolutions, dreams, prospects? Anyway, I'm planing to continue making scenes and landscapes little by little, one by one, as a work. There're so many things! Since I am currently studying for the engraver degree, I would like to make a beautiful metal container for my tiny teddy bear some time in future..
What would you recommend to a person how has just begun to try making Miniatures? Make your favorite things. That way you'll surely have fun! Even if you fail once, face the challenge again and again. Then you can do it! Thanks to Momo, wishing her lots of inspiration for future gorgeous creations! And thank you for reading! =) Good luck. Божечки, ну какая милейшая прелесть!